On Friday February 18th and Saturday February 19th, Trauma Specialists from The Montreal Children’s Hospital will cheer on various hockey teams from novice levels to the Montreal Juniors as they participate in a Hockey Tournament in Pierrefonds at the Sportplexe 4 Glaces Pierrefonds Arena. More importantly, however, they will be spreading awareness about concussions in sports by talking to players, parents and coaches, and focusing on preventing the incidence of mild traumatic brain injuries in hockey. Every year, The Montreal Children’s Hospital Emergency Department sees over 15,000 children and adolescents who have sustained a traumatic injury. Injuries sustained range from minor to fatal. Upwards of 500 of them are serious enough to require hospitalization and the interventions of the trauma specialists from 30 different departments. 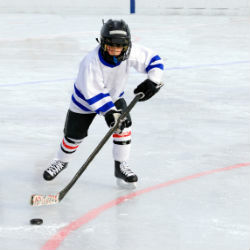 Approximately 35% of trauma cases seen at The Montreal Children’s Hospital’s are related to recreational and sports activities, of which at least 1000 have sustained concussions. For more information about concussions, click here to consult our Concussion Kit .